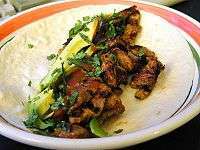 Carne asada can be purchased from meat markets either prepared (preparada, i.e., already marinated) or not (no preparada), for marinating at home. The meat can be marinated in many different ways, from simply rubbing with salt to using spice rubs such as lemon and pepper or garlic salt and lime, before being cooked on a grill. Some recipes use beer in the marinade. It can be chopped so it is more easily put into tacos and burritos. 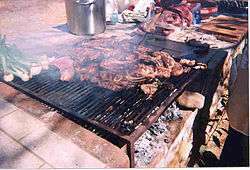 In Latin America and the American Southwest, the phrase "carne asada" can also be used to describe a social event, the equivalent of a social barbecue, where family and close friends gather.